Navigate: Home → Alphabetical → Beuys Joseph [Link Partners] [Help] → Help support the e.Gallery! 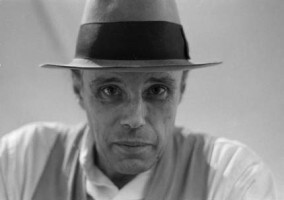 Having spent his childhood and youth in Kleve, Joseph Beuys was shot down in the Crimea when he was a fighter pilot. The Tatars living there wrapped Beuys in fat and felt to save his life. These two materials later became important features in the artist's work. From 1947 to 1951 Joseph Beuys studied sculpting under Enseling and Mataré at the Düsseldorf art academy, where he later taught himself from 1961. Beuys' first public Fluxus event took place in 1963 in the course of the “Festum Fluxorum Fluxus”. A short time later Beuys contributed to the “Demonstration for capitalist realism” in a Düsseldorf furniture store alongside Lueg, Richter and Polke. Beuys' increasing political committment, the foundation of various associations and parties, results from his demand to allow more creativity in all areas of life and to actively contribute to the creation of the state as a “social sculpture”. Beuys' efforts culminate in his participation in the occupation of the students' office to demonstrate for equal opportunities in education, which lead to his instant dismissal in 1972, which was revised in 1978. Beuys' oeuvre includes various artistic media. The artist's declared goal is to create a unity of art and life. His works show strong influences of anthroposofical teachings, mythology and religion.